Downtime for a teacher is troublesome, but downtime for a sub can spell doom. When left to their own undirected devices, many students crumble. Don't let this happen to you! 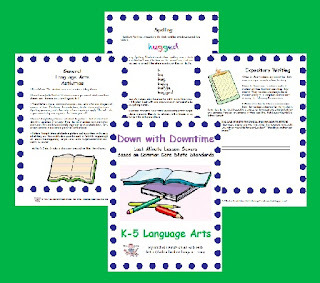 My Down with Downtime product line offer suggested activities to add on to the end of any lesson to occupy the students. And now Reading and Language Arts packets are available to go along with the previously published Math. All sets are great for K-5. Visit Sub Hub to find out the scoop. Wow, you're SO creative! Never really thought about down time. We're usually grinding all day, but their is that down time. Thanks for some great ideas.